In the expanded 2nd edition of my book Tiananmen’s Tremendous Achievements, I describe three black boxes in China: The Politburo Standing Committee, the powerful elders behind the scene and the secret police. Before the establishment of the CCP (Chinese Communist Party) Dynasty with a core like an emperor, there was only one black box at China’s power center with its inner operation kept as top secret. Now, however, there are two black boxes: the PSC and the group of elders who have greater power than the PSC and whose operations are even more carefully guarded secret as the elders would rather have people believe that they have really retired and would not interfere with PSC’s work. Regarding the first black box, we indeed have much more information. We know what they are doing and where they are and see them often on TV screen. If one of them has been absent from news and TV screen for some time, we would wonder what has become of him. That was the reason for people’s amazement at Xi Jinping’s long absence in early September, 2012. Only, we know little about PSC members’ personal life. As for the black box of the powerful elders who play their important role and exert their great influence in secret, we have absolutely no access to information about them. Usually, we do not even know where they are and what they are doing. However, I believe that the elders are informed of the PSC’s operations and consulted in secret when the PSC makes important decisions. Their consent is indispensable for promotion, removal and punishment of high officials. An elder often has contacts with the members of his faction and sometimes protects them, but outsiders have entirely been kept in the dark about all those done by the elders. In fact, if an elder remains entirely inactive, it is impossible for him to remain influential, especially for Jiang Zemin to maintain his power as the core for years after his retirement. Due to the lack of available information about the elders, a party congress, especially the 18th party congress, provides rare chances to see the elders and know their health conditions and ranking and understand their influence. I describe the major factions in CCP and the ranking of their position and strength in the chapter based on my observation of Chinese politics, especially official reports on the 18th CCP congress. I pay great attention to the order of the elders when they walked into the meeting hall to attend the meetings of the congress as each elder had his idea of the order based on the Chinese etiquette to let those with higher seniority or greater power go first according to what they had been used to and their likes and dislikes of other elders. The change in elders’ walk-in order indicates the outcome of the power struggle between them during the congress. Obviously, Li Peng’s faction was a loser in the congress. At the opening meeting Li Peng’s protégé Luo Gan went before Wu Guanzheng of the legal and democracy faction and Zeng Qinghong of the Shanghai faction. At the closing meeting, Luo fell behind Wu and Zeng to the last of the line. Let’s see the elders’ walk-in and seating order and how they were shown in CCTV footage in the National Day reception in the evening of September 30, 2014. Readers must be clear that the order is different from their order in the text of official reports, which is based on their seniority and former positions and ranking and usually remains unchanged. When the leaders walked into the reception hall, we saw a short shot, in which Xi Jinping went first followed by Jiang Zemin, Hu Jintao, Li Peng and Zhu Rongji. No other leaders are seen in the shot. Obviously, Jiang’s instruction that he shall appear behind Politburo members was not followed. According to China’s established seating order, there is the official arranged order of the PSC members and powerful elders at Xi Jinping’s table: Xi Jinping, Jiang Zemin, Hu Jintao, Li Keqiang, Zhang Dejiang, Yu Zhengsheng, Liu Yunshan, Wang Qishan, Zhang Gaoli, Li Peng, Zhu Rongji, Li Ruihuan, Wu Bangguo and others who we cannot clearly see. When Xi Jinping was giving a speech, close-up shots were shown one by one of Xi Jinping the general secretary, Jiang Zemin the former general secretary, Hu Jintao the former general secretary with less seniority, the current PSC members other than the general secretary Li Keqiang, Zhang Dejiang, Yu Zhengsheng, Liu Yunshan, Wang Qishan, Zhang Gaoli and the elders Li Peng, Zhu Rongji, Li Ruihuan, Wu Bangguo, Wen Jiabao, Jia Qinglin, Song Ping, Li Lanqing, Zeng Qinghong, Wu Guanzheng, Li Changchun, Luo Gan and He Guoqiang. This is similar to the close-up shots in CCTV footages on meetings of the 18th CCP National Congress in November 2012. In the footages, Hu Jintao the then general secretary appeared the first, followed by Jiang Zemin the retired general secretary, the then PSC members other than Hu Jintao, i.e. Wu Bangguo, Wen Jiabao, Jia Qinglin, Li Changchun, Xi Jinping, Li Keqiang, He Guoqiang, Zhou Yongkang, and then the elders, i.e. Li Peng, Zhu Rongji Li Ruihuan, Song Ping, Wei Jianxing, Li Lanqing, Zeng Qinghong, Wu Guanzheng and Luo Gan. Only the PSC members retired in 2012 were added to the old elders according to the ranking of their original positions. The one of the same position as an old elder appears later due to his less seniority. We know that the arrangement of the close-up shots has been made by the current PSC. However, we do not know the order that will be decided by the elders on their own as there is no shot to show the walk-in order of all of them. Anyway, the footage gives us a rare glimpse of the powerful elders behind the scene. Their presence gives us the impression that they have so far not been targets of the anti-corruption campaign. Former PSC member Zhou Yongkang was absent as he is being investigated for corruption. Wei Jianxing was absent perhaps due to old age and poor health as he is known for his honesty. The name of those powerful elders including Jiang Zemin and Hu Jintao appear after the Politburo members in all the texts of official reports on the reception. In deciding close-up shots and the order of the shots, the current PSC did not follow Jiang Zemin’s instruction and placed Jiang’s shot right after Xi’s shot instead of after the shots of Politburo members. 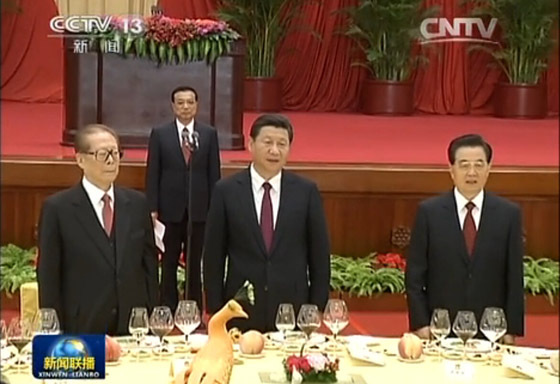 All the elders sat at Xi’s table but no Politburo or Central Secretariat members sat there. It indicated Xi’s respect for the elders. Xi has encountered serious opposition in his anti-corruption and mass-line campaigns and further reform. He wanted to have all the powerful and influential elders to attend the reception to show their support for Xi while the elders are glad to be present to prove that unlike Zhou Yongkang, they are not targets of the anti-corruption campaign. To show Xi’s respect for Jiang Zemin, the core of CCP with dominant power, and Hu Jintao, the head of the powerful Communist Youth League faction, close-up shots of them are shown three times while those of the PSC members other than Xi are shown only twice. When all the participant held up their glasses for a toast, Xi Jinping clinked glasses only with Jiang Zemin and Hu Jintao. The footage, though not long, give us quite much information of the black box of the powerful elders.